We manufacture the most advanced wine barrel and picking bin washing systems in the world. We have over 30 years experience designing and manufacturing innovative solutions for your oak barrel and picking bin washing needs. Tom Beard Company is dedicated to providing cost effective, quality wine barrel and picking bin washing equipment for all vintners in the fine wine industry. To manufacturing and providing the most advanced wine barrel and picking bin washing equipment and solutions in the world. To innovate and advance our designs to reduce water usage and minimize waste water generation. Water Conservation - The Tom Beard barrel washing and picking bin washing machines have been designed and refined to use the least amount of water to completely clean barrels. This innovation has happened as a direct result of working with our customers to refine the parameters. New retrofits are available to help reduce water use from 25% to 50%. BlueMorph UV-The ultimate water saver in Tank Sanitation. Visit What's New to learn more about this revolutionary technology. Waste Water Minimization - The Tom Beard washing machines are designed to use the least amount of water possible to completely wash and clean your barrel or bins. This minimizes the amount of waste water generated. Our systems can be delivered with a water recycling feature future reducing the waste water output. Uniform Cleaning Quality- our unique rotating spray head delivers uniform cleaning quality. Reduced Labor Cost- our fully automatic barrel washing systems save thousands of dollars and improve quality at the same time. Reduced cycle times of 2-5 min washing cycles greatly improve production speed. Rugged Construction- All of our machines are constructed of heavy gauge 304 stainless steel and NEMA 4X (corrosion resistant) control box. Low Maintenance- There is only 1 part to stock and replace, (it acts as two seals). The machines are virtually maintenance free. We have set these design goals based on your High Standards for the Cleanest most cost effective barrel washing and bin washing systems available. Our Customers tell us We've Succeeded. The Tom Beard Company -Barrel Washing Systems for Today's Fine Wine Vintners. cleaning pressure with an integral pump, and fluids are controlled via pneumatically actuated valves. For ease of operation the entire system is controlled with a PLC (Programmable Logic Controller) via a touch screen. Our Proprietary design and software programming provide excellent cleaning results, with minimum water usage and waste water generation. The TBC-CABINET / 2 & 4are cabinet style machines with a body which safely houses the majority of the working components in a robust cabinet for added durability and component protection. These machines have the advantage of a separate barrel roller assembly which allows the use of barrel racks that are non-standard, including the stackable nesting racks. These machines are available in both 2 and 4 barrel configurations. Like all TBC Barrel Washers they feature the state of the art components, proven design, and our full one year warranty backed with our dedicated service and parts support system. 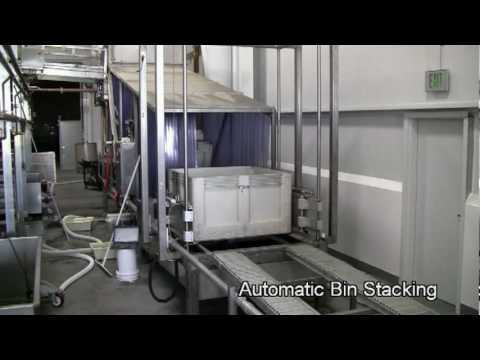 TBC 1/2 TON AND 1 TON BIN WASHING SYSTEMS are designed to handle plastic picking bins. The machine receives the bin from the forklift, inverts it, washes all surfaces with high pressure water, turns the bin back upright, and stacks bins 3 high for return to the field. Recycling of wash water is an option, as well as accumulation and transfer of stacked bins. The system is designed to deliver excellent cleaning results, minimize water utilization, minimize waste water generation, and provide ease of maintenance. TBC has applied for a US patent for this machine. New forklift attachment to lift and transport barrels safely. Designed to safely remove stacked barrels from the inside of trucks, and safely load onto barrel racks. Reduces the chance of employee injury lifting and moving heavy barrels. Manufactured out of 304 stainless steel for sanitation and duribility. Mounts to forklift mast similarly for the forks and is locked onto the forklift. Utilizes forklift hydraulic system four (4) valves to control barrel gripping and forward tipping. Features quick-connect hydraulic fittings and a quick-connected mast system for easy installation and fast change overs. Can be customized to any class of forklift mount. Barrel Picker works on empty wine and spirit barrels with a croze end (near the quarter hoop)barrel diameter range of approximately 22" to 26" at a 31.5 spacing from barrel center. P&L Specialties is a design, engineering, fabrication and service company that has been producing the highest quality stainless steel equipment & aluminum structures since 1984. We design, build, integrate and support equipment in many service applications. We believe that value is a combination of quality, service and price. As you get to know us and our products, you will discover that we truly understand and respond to the unique needs of our clients. Custom designed 1/2 ton bin washing system. this is a permanent installation we also offer portable systems. We are looking forward to one of our favorite tradeshows: WIVI Central Coast. For decades, Tom Beard Company has been helping Central Coast wineries - where water conservation is crucial – conserve with 2 & 4 barrel washing equipment and processing systems for larger volumes. Please visit us at Booth 234 and talk with GM Chuy Mendoza about our latest water, labor and time saving innovations. See you there! Check out the video of the Tom Beard Barrel Washer and Steamer. P&L Specialties is a design, engineering, fabrication and service company that has been producing the highest quality stainless steel equipment & aluminum structures since 1984. We design, build, integrate and support equipment in many service applications. We believe that value is a combination of quality, service and price. As you get to know us and our products, you will discover that we truly understand and respond to the unique needs of our clients. Introducing the newest product to the Tom Beard Company, The Barrel Picker! NEW forklift attachment to lift and transport barrels safely. Designed to safely remove stacked barrels from the inside of trucks, and safely load onto barrel racks. Reduced the chance of employee injury lifting and moving heavy barrels. Manufactured out of 304 stailness steel for sanitation and durability. Mounts to forklift mast similarly to the forks and is locked onto the forklift. Utilizes forklift hydraulic four (4) valves to control barrel gripping and forward tipping. Features quick-connect hydraulic fittings and a quick-connect mast system for easy installation and fast change overs. Can be customized to any class of forklift mount. Barrel Picker works on empty wine and spirit barrels with a croze end (near the quarter hoop) barrel diameter range of approximately 22" to 26" at a 31.5 spacing from barrel center. Contact Halley for more information! Barrel Washer and Steamer All in One! 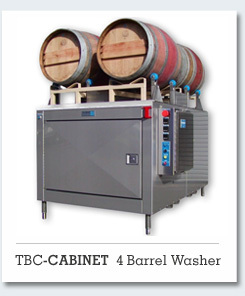 Tom Beard Company introduces our new innovative TBC 2-BARREL AND TBC 4-BARREL COMBO WASHER AND STEAMER. The machine is a safe and efficient way to wash and steam barrels without moving barrels from machine to machine. It is a stand-alone unit that delivers measured amounts of washing and steam to the barrels. After the wash cycle is complete it shifts the barrels into the steam position. It automatically inserts the bung to establish a vacuum for an adjustable time period and monitors vacuum in the barrel to reduce possibility of damage to barrels. The machine is loaded by forklift and operates via a programmable controller. There is no need for workers to be in the vicinity of the steam at any time. The model TBC 2-BARREL AND TBC 4-BARREL COMBO WASHER AND STEAMER are compatible with most standard 2-barrels or 4-barrel racks. TBC barrel washing machines have been reliably in service worldwide since 1983. All TBC products come with a full one-year warranty and are backed with our dedicated service and parts support. As an innovative leader in energy-saving technologies, the Tom Beard Company introduces yet another tool for greater labor and cost savings around winery control: VinWizard. Winery management software to monitor, alert and program all winery functions - from an off-site device. After developing successful growth in Austrasia and Southern Hemisphere, VinWizard partnered with The Tom Beard Company to be its North America sales arm, and introduce U.S. Beverage companies to monitored, automated, off-site management of winery processes. Modular in design, a VinWizard System is flexible in use and has many entrance points. (Click Here for All Modules). A new and exciting tool for winemakers is the MULTIPLE LEVEL TEMPERATURE PROBE. Unlike other Temperature Software and Systems, VinWizard’s Multi-Level Temperature Probe provides multiple sensors inside the tank providing up to 30 different temperature points. In addition, automated services like pump-overs are activated based on various data, such as cap temperature. Whether starting small or starting from scratch, Tom Beard Company can set you on the right economic and energy saving game plan for your winery. To participate in a private tour of a North Bay VinWizard System, contact Chuy Mendoza, ( 707-523-3150 or Email). Visit VinWizard at Unified - Booth 1011 and stop by Tom Beard Booth #612. For More Information on VinWizard look under Products on www.tombeard.com. The Tom Beard Company congratulates Jackson Family Wines for their leadership in both sustainability standards and business longevity practices. The launch of their Sustainable Responsibility Report details and educates the industry on practices that can work for them. We are flattered to be mentioned in the report as a key supplier in their recycling retrofit of their barrel processing line; a project that earned them an Environmental Leader’s Top Project of 2015 Award. Water-saving innovation was the genesis of our first barrel washing machine thirty years ago – and will continue to be our commitment for the future. Assisting beverage companies to retrofit or design new barrel washing systems that help save tens of thousands of gallons of water each year is our passion. Environmental Stewardship reaches beyond Tom Beard Company products; it’s our culture. Tom Beard Company has recently qualified for our 3rd Certificate as a Sonoma County Green Business, a stringent qualification process especially for manufacturing. We understand the grave importance of water conservation, teamwork and innovative leadership, and look forward to further expanding our water saving partnerships. JULY 22, 2016 - SANTA ROSA - Last night at the The NorthBay Business Journal's Maker Awards, The Tom Beard Company was proud to be acknowledged as an Environmental Leader in Manufacturing. Thes awards - formerly called the Manufacturing Awards and co-presented with 101MFG and now in their 6th year - are given to the most outstanding and innovative manufacturers in the North Bay. We are proud to be amoungst other local environmentally and socially-conscious enterprises recognized in Local Production & Manufacturing. Other long-time respected companies honored last night, were :Keysight Technologies (formerly Agilent), M.A. Silva and Labcon sterilization. Equally impressive were the new entrepreneurs coming to the manufacturing fields, like North Bay Maker's 180 Studios in Petaluma, where students of all ages can rent space and learn trade skills; as well as Sonoma-USA, manufacturing bags from rescued from the landfill materials - both provide opportunities that align with our company's culture of Local and Environmental Stewardship. On hand to accept the award was General Manager, Jesus "Chuy" Mendoza. He shares, "Water Savings has always been important, now its a neccessary. Its a 'Win-Win to help our clients save the greatest amount of water, energy and especially money that they can - while saving valuable resources for others in our community." The Tom Beard Company began developing washing machines for wine barrels in 1983. The machines save wineries tens of thousands of gallons of water each year, over spray-ball washing. Innovation has continued to drive Tom Beard Company, now designing retrofit recycling systems for older machines and partnering with global wine partners to develop new multi-barrel recycling systems in processing lines. For more information please visit www.TomBeard.com or contact Chuy Mendoza at chuy@tombeard.com. Wednesday morning Tom Beard Company delivered the first commercial BlueMorph UV sanitation unit to Jackson Family Wines in Windsor CA, and Co-Founder and Alex Farren, CEO of BlueMorph, was on site to hand it over the to an excited JFW team. Over the past year Jackson Family Wines have been testing a prototype of the BlueMorph, a cutting edge technology especially designed to use ultraviolet light for tank sanitation, reducing or eliminating the use of water, power, and chemicals. Exposure to the UV light effectively kills molds and bacteria in the tank, and the BlueMorph works by sliding a 40 pound UV light emitter panel through the door at the bottom of the tank and choosing a preprogrammed emission length based on the size of the tank to ensure a thorough sanitation. A 55 gallon tank cleans in as little as 6 minutes, while a hundred thousand gallon steel tank takes well over an hour, but with no water usage and very little labor and power. After an initial demonstration, Cellar Master Dan Bothelo immediately started training his team on the use of the BlueMorph, including how to determine which program to use and the basic safety precautions when dealing with ultraviolet light. The BlueMorph patented technology is manufactured by Tom Beard Company, and they will be bringing a unit to display at the North Coast Wine Industry Expo where Mark Theis, winemaker for Kendall Jackson will be part of the panel on Conservation, the New Innovation, discussing the BlueMorph and other conservation innovations. Whether its 50% water savings or greater efficiency, a Tom Beard Company 2 Barrel Washer is your best choice. Innovative. Rugged. Reliable. Tom Beard Company has Barrel Washers in STOCK ready to ROLL! Optional Lees Recovery and Wastewater Recycling Systems available. They're IN STOCK TODAY so DON'T DELAY! – Contact your sales rep today to learn more or place an order. 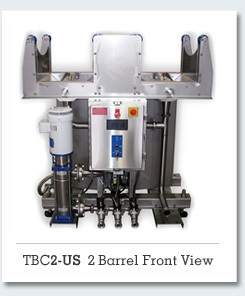 Purchase a TBC Barrel Washer. Replace traditional spray ball washing and save 50% water use, while still providing maximum cleaning efficiency. During this time of great need we can also help with financing. Purchase a TBC Water Recycling System Retrofit with Heat Exchanger – We fit a 50 gallon tank to your current TBC 2 or 4 Barrel Washer, or Conveyor System, which repurposes final clean rinse water for the pre-wash rinse cycle or all of hot rinse cycle. The added heat exchanger heats the rinse water to 160-170° (allowing full barrel sanitization) for a complete wash cycle with water savings of nearly 50%. Purchase a TBC High Pressure Pump Upgrade, (recommended for equipment 2004 and older). Upgrade your TBC 2 or 4 Barrel Washer or Conveyor System, from high volume water with low pressure, to low volume with high pressure, thus increasing washing efficiency and decreasing water use of about 25%. As new mandates and regulations may occur, we encourage you to make a call today. Discuss your equipment needs and schedule a consultation time with a TBC representative while still available. Tom Beard Company has been selected as the official North American Distributor for VinWizard™, an international winery control system that can be managed from any off-site wireless device. This revolutionary technology allows winemakers to precisely control tank temperature and all other aspects of their operation from any location. VinWizard modular systems save wineries tens of thousands of dollars in time, labor, water and power consumption. Tom Beard Company, being a well known product innovator helping clients lower costs while streamlining production, provides the perfect representation for Vinwizard’s unique cost savings systems. Let our factory Certified technicians inspect, service, and adjust your Tom Beard Equipment. We are now accepting calls to schedule your "Ounce of Prevention" Pre-Harvest service. The Tom Beard Company has developed a portable half ton bin washing system. The model TBC-1T-PBW Bin Washer is a fully self contained system that efficiently and thoroughly washes 1 ton and half ton picking bins inside and out, removing field debris, dirt, grape, and sugar residue. The system is modular and portable to facilitate off season storage. The modular design enables tailoring the system to interface with existing grape delivery equipment/systems and processes. The innovative design delivers outstanding cleaning results, minimizes water consumption and waste water generation. 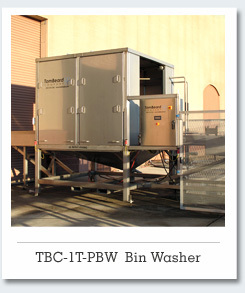 The TBC-1T-PBW modular design allows for incrementally adding more system capability as required. The basic system modular components are: bin loading section, bin inverter section, single pass bin washing section, bin re-inverter section, bin stacking section, final accumulation section, and bin load out section. These sections are fully automated and designed to work together in combinations to suit the requirements. We take great pride in designing and manufacturing the best washing equipment available to the agricultural industry. Our robust machinery is constructed of stainless steel and built to deliver years of trouble free service. Revolution Equipment Sales has launched a full-feature website to support sellers and buyers. Sellers can submit details and photos of equipment they want to dispose of and buyers can see existing inventory. Buyers can also put in a “help me find” request for a particular piece of equipment. This fall, Revolution Equipment Sales plans to add an auction function that will allow buyers to bid and reserve a piece of equipment online to streamline transactions even more. More information is available at the Revolution Equipment Sales website – www.revoquip.com or by calling 707-573-3154. Tom Beard Company had developed and delivered its first portable ½ ton bin washing machine system. The washing system is designed to more efficiently wash ½ ton bins, yielding a cleaner bin, less water use, and reduced labor. Our new portable ½ ton bin washing systems are available with a water recycling option to further minimize the water used and the waste water generated. The Tom Beard Company has applied for a US Patent on its design and function. The Tom Beard Company has been certified as a "Green Manufacturer"! Press Release: August 24th 2010 Santa Rosa, California. The Tom Beard Company, international manufacturer of wine barrel and grape harvest bin washing systems, has been certified as a "Green Manufacturer" by the Bay Area Green Business Program. The Tom Beard Company is the second manufacturer serving the wine industry in Sonoma County to receive this prestigious certification. The Company was awarded its certification and recognized for its environmental achievements at an official ceremony with the Sonoma County Board of Supervisors on August 3rd 2010; there were several other businesses being recognized at the ceremony and the presentation included awards and praise for the commitment to the environment and the economy. The Tom Beard Company was founded in 1983 by Tom Beard, with an unwavering commitment to quality and performance. The company has been recognized many times over the years for their innovative designs and is in the application process for a US patent on their line of grape ½ ton bin and 35lb picking lug washing systems. The systems are designed to recycle wash water and use ozone dissolved in water to sanitize the bins. “We have always been very purposeful in our designs to ensure they perform excellently with the minimum water usage possible. Over the years we have improved the designs and our current systems use 50%+ less water than in years past. We are also very aware about recycling scrap and reusing materials and have always valued being good Stewarts of the environment. We went through this certification process earlier this year with P&L Specialties so having had that experience really helped and was a natural next step for the Tom Bread Company” said Ed Barr TBC president. The Bay Area Green Business Program is a partnership of local utilities and government agencies. It was created to help businesses improve environmental standards and better comply with environmental regulations. It is a three year certification and requires renewal. This process encourages businesses to conserve resources, prevent pollution, minimize waste, and reduce their footprint. For more information, go to www.greenbiz.ca.gov. For more information about Tom Beard Company, call (707) 573 3150 or go to www.tombeard.com. 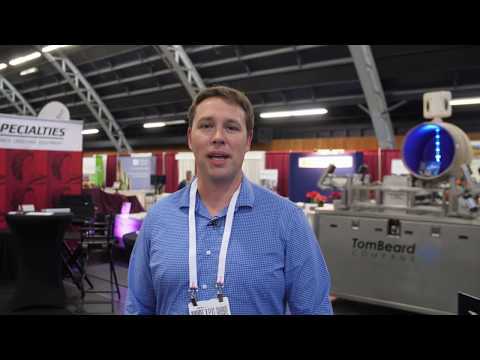 Tom Beard Company is partnering with VinWizardâ"¢, an international winery control system that can manage operations from any wireless device. This innovative system gives winemakers accurate data and absolute control of tank temperature and pump over routines from any location via their mobile device of choice. In addition, the system has the ability to interface to any other aspect of the operation for alarm, monitoring and control purposes. Comprehensive control and unique software logic allows for large savings in water, energy and labor.